The tapped density of powdered, granular of flakey material is highly dependent on the manner in which the particles are packed together. During tapping, particles gradually pack more efficiently, the powder volume decreases and the tapped density increases. Under controlled conditions of tapping rate, tap force and cylinder diameter, this condition of maximum packing efficiency is highly reproducible. 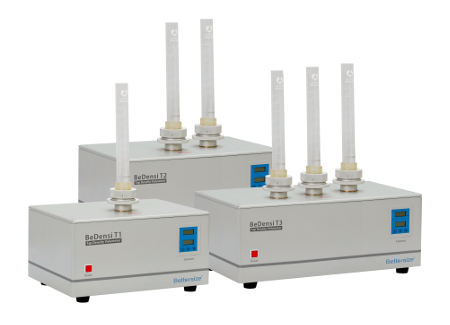 Tapped density measurement (sometimes referred to as tapped bulk density, or just tap density) is formalized in a number of international standards to which BeDensi T series models conform. If you need to ensure the same fixed number of taps for all analyses, a special lockout feature is provided which prevents unauthorized changes to the counter.